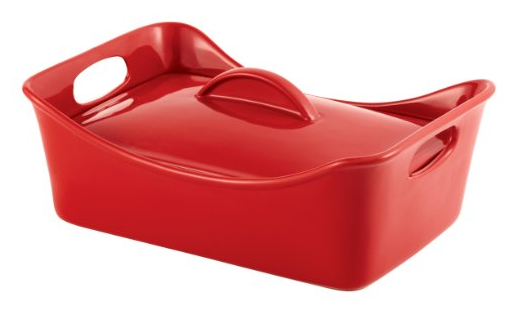 Make baking a huge batch of Sloppy Joe and Macaroni Casserole a breeze with the Rachael Ray Stoneware Covered Bubble and Brown Casseroval Casserole. 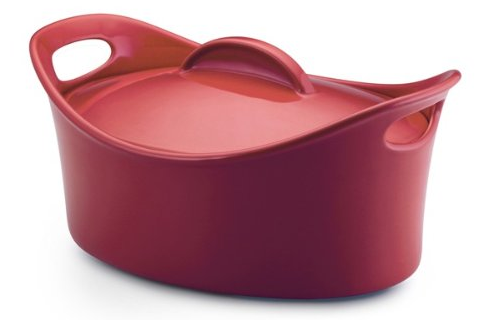 This bold-hued stoneware casserole offers extra-large capacity allowing for cooking for a crowd. You will also loves its contemporary, playful shape in a vibrant and fun color which goes directly from oven to table. Also feature extra wide handle holes for easy grip. Dishwasher, microwave, freezer safe and oven safe to 500-Degree F.
Now it is fun to bake scrumptious turkey and spinach manicotti with the Rachael Ray Stoneware 3-1/2-Quart Covered Rectangle Lasagna Casserole. 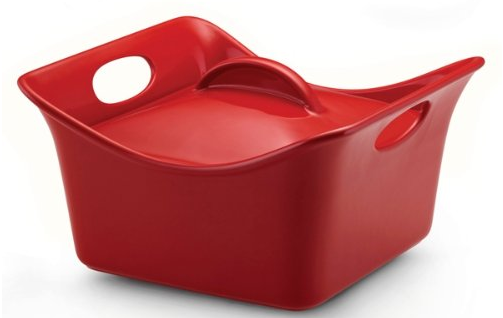 This rectangle casserole has wide handles for a confident grip when putting the casserole in the oven or pulling it out when food is ready. Safe to use in the microwave, freezer and oven, up to 500 degrees Fahrenheit. Easy to clean– dishwasher safe. Attractive, functional and works great, the Rachael Ray Stoneware 3.5-Quart Covered Square Cassersquare Casserole makes a great addition to any kitchen. 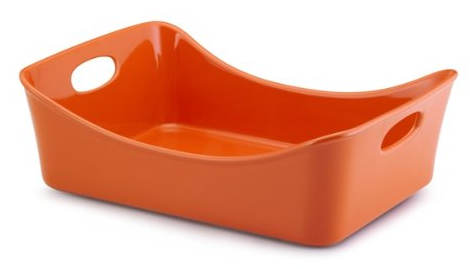 This vibrant and fun square baking dish features contemporary design and is great for baking chicken, veggies or a baked cheesy pasta. The extra wide handle holes provide a good grip from any angle. Safe to use in dishwasher, microwave, freezer safe and oven to 500 degrees F.
Prepare tasty casseroles and cobblers with this set of 2 Bubble and Brown oval bakers from Rachael Ray. Constructed in fully vitrified stoneware, these durable strong bakers are chip-resistant, and nonporous. They feature colorful glaze, wide oval handle holes, scooped sides, and fashionable design, making them a great addition to your bakeware. The smaller baker can nest inside the larger for easy storage. Need a contemporary baker for lasagna, baked ziti or casseroles? 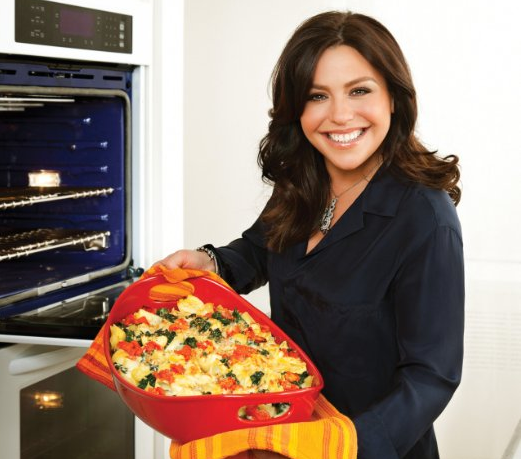 The Rachael Ray Stoneware 9-Inch by 13-Inch Rectangular Lasagna Lover Pan is a great option. Great for melting cheesy lasagna, roasting chicken, this multi purpose pan is also great for use as a serving tray for salads or fruit. 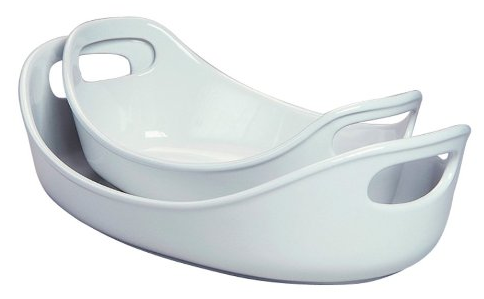 It features a rounded contemporary shape with extra wide handle holes for a good grip. Microwave, freezer safe and oven safe to 500 degrees F. Dishwasher safe for easy cleanup.